LAS VEGAS (March, 2014) -- Skyline Exhibits, designer and producer of trade show exhibits, graphics and services, was honored with a Buyers Choice Award, which recognizes the best new products at EXHIBITOR Show, the biggest event in the trade show industry. The winning entry was Skyline's revolutionary new product, the air-powered WindScape® Exhibit System. To qualify for the New Product Showcase and inclusion in the Buyers Choice Award, exhibitors' product must meet several criteria including market availability, product introduction dates and exclusive introduction at EXHIBITOR2014. The Buyers Choice Award winners are determined based on four judging criteria: design innovation, broad-based applications, addressing an industry need or issue, and does it enhance the job of the exhibit marketing professional. A panel of judges, including Certified Trade Show Marketer (CTSM) graduates, selected the winners. "Given our three years of development of a system that solved so many exhibitor pain points all in one product, we hoped that we would have a fair shot at winning the award," stated Jon Althoff, Senior Director Global Marketing, Skyline Exhibits. "Our crack exhibit staff was continuously demonstrating WindScape in our booth and based on attendee reactions - and exceptionally large lead count - we knew this product was a hit." Skyline developed WindScape from technology proven durable in sporting and military applications. WindScape consists of an inflatable frame and pre-installed fabric graphic. Advantages include time and ease of set up along with extremely small packing. "A full 10-foot display goes from case to exhibit ready in less than seven minutes with the single push of a button," stated Sofia Troutman, Segment Manager, Skyline Exhibits. "And it's so compact the entire display along with inflation kit packs in a small carry-on case." Skyline currently has 46 standard shapes ranging in size from a tabletop display to full conference rooms, 16' tall towers and massive hanging structures. The ability to create custom shapes is also available. 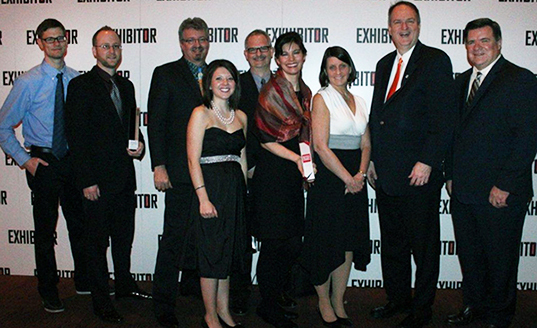 Skyline was also honored for its exhibit design in EXHIBITOR Magazine's first annual Portable/Modular Awards. Skyline's design for client Milliken & Company won the Best Island Exhibit Over 600 Square Feet category. The exhibit featured another of Skyline's recently released products, the backlit PictureCube® Exhibit System.